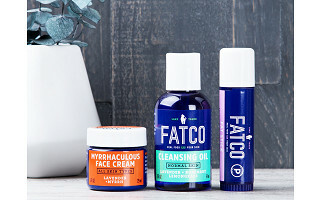 While a paleo diet—of all-natural, animal and plant-based foods—nourishes you on the inside, FATCO’s ultra-rich paleo skincare nourishes you likewise on the outside. It all starts with tallow from grass-fed, pasture-raised cows here in the USA. Tallow (aka animal fat) provides the nutrient-rich base for the skincare. 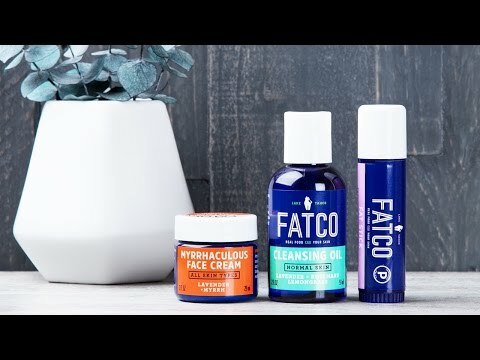 It’s super moisturizing and packed with Vitamins A, D, E, and K. FATCO blends in essential oils and a mix of plant-based fats, like coconut, almond, and avocado oils—but never anything artificial. 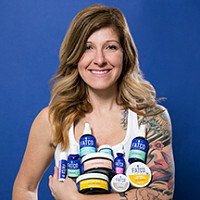 Tallow was the must-have skincare ingredient for centuries, but it fell out of favor over the years—in step with whole foods disappearing from our diets, notes Founder Cassy Burnside. Cassy is devoted to a paleo lifestyle, and adheres to a "nose to tail" approach—using all parts of an animal. The tallow she sources would typically be tossed away, but thanks to her, this nutrient-packed element can nurture your skin. Grommet Nation! I'm Julia (aka "Snacktime") the marketing guru on Team FATCO. We are excited to be on The Grommet and answer any questions you have about us and why fat is your friend! Julia, I am looking for a hand cream to help with my rough,dry skin.What would you suggest? I would recommend our Fat Stick for cracked hands and cuticles...you can see the listing above. Can you please describe the scent of the products? @bonnie All of our products are scented with therapeutic grade essential oils. The Myrrhaculous Face Cream smells well...Myrrhaculous if I do say so myself! It smells like a relaxing stroll through fields of Lavender! As for the Cleansing Oil, I have 2 words...SPA DAY! With Lavender, Rosemary & Lemongrass, the Cleansing Oil smells like a trip to a 5 Star spa! And now for my personal favorite...the Fat Stick! This guy really packs a punch! Cassy (our Founder) describes this smell as a peppermint patty! It features Peppermint & Lavender essential oils. The fat stick is actually not only a great moisturizer but is awesome to put under your nose if you have an upset tummy for the refreshing an soothing peppermint scent. Seriously the Fat Stick can do ANYTHING! @Julia Do you have anything that does not have Lavender essential oil in it? I am very allergic to Lavender and will not be able to use any products that contain it if I want to keep breathing. Thank you. @Gail We do have several other products that do not contain Lavender. You should request that The Grommet carry those! Wow, nose to tail. Using every part. How about using no parts? You're so very cavalier on taking the life of an animal and dissecting it, to use all of its parts. Have you ever petted a cow? They have brains, emotions, and feelings. Shame on you. All the way to your bank account. Hi Nan, no one here is dismissing the life of a cow. We appreciate you sticking up for your values, but as is mentioned in the story, FATCO is using tallow that would otherwise be discarded. They are not responsible for taking the life of an animal. @Mike Nice try, Mike, but it doesn't wash. This product line exploits animal cruelty by condoning the use of animal products in cosmetics. I expect better from the Grommet. Hi Susan, again, while you may not be interested in the product because it is animal-based, that doesn't mean it condones or exploits animal cruelty. Nan and Susan, they are coming after the fact and saying that they are picking up what would just be thrown away and saying wait this is useful. Just like the Native Americans that believe that everything has a spirit and a purpose. Which everything does have a purpose. So when they needed to kill for food they then used as much of the animal that could be found to be of use. It's not cruelty it's living. Thank you Jonathan for making that point. I'd like to know how exactly Nan knows the emotions of a cow actually, and piping in from Susan that she wouldn't take it for free? I love the Grommet and your product!! Neither of them need to purchase nor comment. Thanks very much Pamela and Jonathan for your support! You must have missed the recent article in Smithsonian.com that disses the myth that early hominins relied heavily on meat for their diet. The article is entitled "The Paleo diet may need a rewrite..." and it ends with this sentence: "Hominins were probably predominantly vegetarian." That said, I shop cruelty-free, and would not use these products even if you were giving them away. I expect better from the Grommet. Hi Susan, we note in our story that the paleo diet is a mixture of animal and plant-based foods which that article you reference supports. The paleo diet fad might not be accurate, but that doesn't make FATCO's or our depiction less so. We appreciate you sticking to your shopping values. @Mike And I would appreciate a more discerning Grommet. This launch does not show your best side. It is neither innovative nor intriguing, and for some of us, it is very offensive. I know you can do better. Hi Susan, we hear you. We and a few others on the board here do find it innovative and intriguing. We know not everyone is going to love every single Grommet and for the sake of everyone's bank accounts, that can be a good thing. So Susan if I find what you do offensive should everyone stop doing it. We then would have nothing. This looks like just what I need. I am so sensitive to chemicals! But some non-chemical things throw me into a tizzy, too. Come payday, I'm buying!!! But just in case something does bother me, what is your return policy? Hi Mary, we hope it is just what you need. Unfortunately, due to sanitary reasons, we cannot accept returns on hygiene or cosmetic products such as FATCO. @Mike Well, the good news is that it isn't a big investment. So, if it doesn't work for me, I'll feel safe passing it along to someone else! Thank you. I noticed in the description of the Anti-aging Face Cream that it says "Keep out of the reach of children." Why is that? @Mary Hi Mary! There is nothing dangerous for children in there, we put that on the label because it is good to keep all body care and cosmetics out of reach of children just in case! We recently had a friend whose 4 year old ate half a jar of our product and she was happy that it was a safe and natural product that she didn't need to worry about! If you are ever stranded on a dessert island with some FATCO, it would be safe to eat (although we don't promise it would taste good)! How quickly does this absorb into the skin? How greasy is it? And how does it stand up to occasional hand washing? I'd love to find something that I don't have to re-apply every time I wash my hands. Thanks! @Mary Hi Mary! It absorbs into your skin in a few minutes and doesn't leave a greasy residue. A little goes a long way so if you feel like it is too heavy then we recommend using a bit less. I will also reapply with the Fat Stick during the day! I am interested in your product but am wondering about shelf life and preservation. In the face cream, for instance, is the myrrh sufficient as a preservative? Would refrigeration be optimal? @Barbara Hi Barbara! We recommend that you use your products within one year of manufacturing and then use them within 6 months of opening. The Face Cream does not need to be refrigerated, it is okay to store it at room temperature. 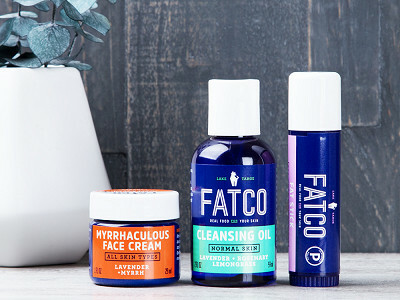 While a paleo diet—of all-natural, animal and plant-based foods—nourishes you on the inside, FATCO’s ultra-rich paleo skincare nourishes you likewise on the outside. It all starts with tallow from grass-fed, pasture-raised cows here in the USA. Tallow (aka animal fat) provides the nutrient-rich base for the skincare. 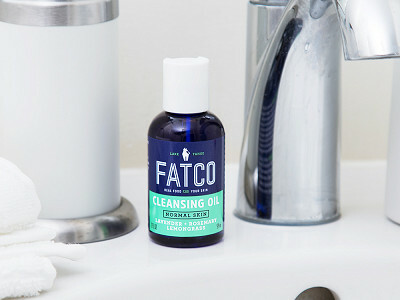 It’s super moisturizing and packed with Vitamins A, D, E, and K. FATCO blends in essential oils and a mix of plant-based fats, like coconut, almond, and avocado oils—but never anything artificial.